Jaganmohan Palace is one of the majestic palaces that enhance the glory of the princely state of Mysore. The palace is an outstanding work of architecture that stands testimony to the taste of the erstwhile rulers of Mysore, the Wodeyar Kings. The beautiful palace had served as the home of the royal family of Mysore from 1897 to 1912. The palace has been witness to many important events in the history of Mysore. Jaganmohan Palace now acts as an art gallery and a function hall. The Jagan Mohan Palace was constructed in 1861 by the then king of Mysore, Krishnaraja Wodeyar III as an alternate residence for the royal family. The official residence of the Wodeyar Kings, the Mysore Palace was gutted in a massive fire in 1897 during the royal wedding of Princess Jayalakshmanni. In the aftermath of the destruction of the Mysore Palace, the Jagan Mohan Palace was used by the royal family as their home. It acted as the royal residence till the reconstruction of the Mysore Palace was completed in 1912. During this period the palace also served as the place from where the king used to hold his daily durbar as well as the special Dasara durbar. The coronation of Krishnaraja Wodeyar IV took place in the pavilion of the palace in 1902. The initial convocation ceremonies of the Mysore University were organized inside the Jagan Mohan Palace. The first session of the Mysore Legislative Council was held in the palace in July 1907. The Jaganmohan Palace is a three-storied structure constructed in traditional Hindu style of architecture. The original palace was extended in 1900 and an external frontage with a hall was added to the existing structure of the palace. This new frontage has three entrances. The entablatures of the palace have intricate carvings of religious motifs and miniature temples. The walls of the interiors are decorated with murals depicting grandeur of Mysore Dasara, the lineage of the royal family and other events related to Mysore. The main door of the palace is a masterpiece of art in itself. The two sides of the huge wooden door have intricate carvings of Dashavatara, the ten incarnations of the Hindu God, Vishnu. In the year 1915 the Jaganmohan Palace was converted into an art gallery. It was renamed as Sri Jayachamarajendra Art Gallery in 1955 after the last king of Mysore, Sri Jaya Chamarajendra Wodeyar Bahadur. Sri Jayachamarajendra Art Gallery is one of the best art galleries in South India. It contains among other priceless treasures a spectacular collection of artifacts and paintings that were once a part of the royal family of Mysore. The art gallery has more than 2000 invaluable paintings on display that depict different styles of painting like those from Mysore, Shantiniketan, Mughal period and Western countries. Among the treasure trove of paintings displayed in the gallery are an exceptional and rare collection of Rembrandt paintings and works of several other great western artists like P.P. Ruben, Aless Caddy, Nikolai Roerich, Titan, Jiladin Ville and wonderful miniature paintings by Gunoy. The Indian section of paintings houses excellent works by masters of the art world like Raja Ravi Varma (the prince-painter of Kerala), Raja Rama Varma (brother of Ravi Varma), Rabindranath Tagore, S.L. Haldenkar, Ishwardas, M. Veerappa and Subbukrishna. Among the notable paintings in the gallery is the ‘Light of hope’ by Haldenkar. The diverse collection of antiques and exhibits in the gallery includes sculptures, weapons of war, antique coins, currencies, musical instruments, brassware, portraits, mementos, furniture, ceramics, ivory and sandalwood carvings, Myosre gold leaf paintings and an exceptional French musical clock. 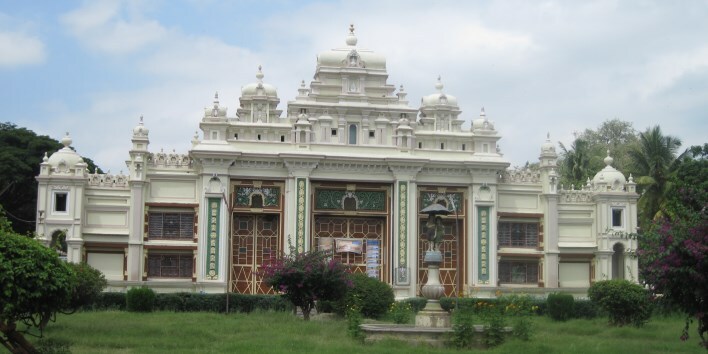 The large auditorium of the Jaganmohan Palace was constructed in the year 1900 and opened to the public in 1980. Since then it is used for staging various cultural events like dance performances, music concerts and festivals, dramas, cultural programs and yearly programs during the Dasara celebrations, etc. This auditorium was once used by the members of the Mysore Royal Family to view art and cultural performances. Various renowned artists of national and international repute perform in the auditorium now. The auditorium is maintained under Sri Jayachamarajendra Art Gallery Trust.